Why hybrids don’t work – HubNut – celebrating the average! After my EV post yesterday, two people independently asked for my thoughts on hybrids. I did reply to both, as I’m polite about such matters, but here follows my reply in more detail. I’ll start with my conclusion. Hybrids don’t work. A bold statement. So why do I think that? Let’s take the BMW i3 Range Extender as an example. BMW is pretty much unique in offering the i3 in fully electric form, or halfway-hybrid with a range-extender engine. First, there’s cost. 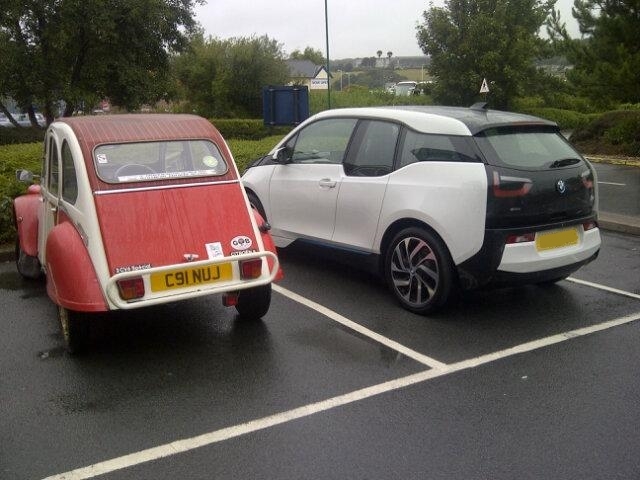 After government grant and at current prices, you’re looking at £25k for an i3. Opt for the one with an engine and that prices rises to around £28k. But, the engine only kicks in when charge is low, which means for a lot of time, the electric motor is having to work harder to haul unnecessary weight around. That makes it slower AND shortens the range on electric power. While the engine does double the overall range – from around 80 miles to 160 miles – it does so by making a buzzy din from its twin-pot engine. It only has a nine-litre fuel tank, which’ll last a maximum of 80 miles. It sounds like a bit of a poor compromise and just isn’t the answer for a long-distance trip. My humble 2CV, pictured below with an i3, can travel further on one ‘charge’ from its 25-litre fuel tank, which feeds a twin-pot engine that makes a buzzy din. And that sums up hybrids for me. There are some very clever ones – like Mitsubishi’s PH-EV where the engine can either charge or provide direct power – but it seems to me that all of these hybrids are just a desperate attempt to keep the internal combustion engine going for a bit longer. Once the problems of range are addressed – an Tesla especially are making huge leaps here – then the hybrid becomes pointless. Bear in mind that in real-world tests, the PH-EV seems to average 39mpg. Even an i3 Range Extender will struggle to reach that if you do a lot of driving with it undercharged. Yes, the compromise will work well in cities – you can float around on EV power and keep the petrol engine for when you need some oomph – but it all reeks of compromise to me. There is a better way. That way is to either stick with your internal combustion engine – they’ve been transporting us pretty well for decades – or go the whole hog. Go full electric. Hybrids are a flash-in-the-pan. They, on paper at least, meet a set of requirements that currently exists. However, I predict that within five years, battery technology and the charging network will have improved to the point that electric makes absolute sense – even if you need to travel long distance. Worst of all the hybrids for me is the Toyota Prius. Here is a vehicle that seemed to exist purely to try and appease the guilt of some motorists. But it’s rubbish really. Real-world economy seems to be in the region of 56-58mpg. That’s well within reach of modern diesels, and a fair few petrol models too. My 2CV can achieve 54mpg, and that’s older than the hills. It still manages to seat four (friendly) adults and have a boot. So, sorry hybrid technology. A lot of research has gone into making something that’s barely any better than just a normal engine. If you really want to make the jump to electric, jump all the way. And no, I’m not convinced by Hydrogen either. Carting explosive petroleum around the globe is dangerous enough! Plus you’ve got to get the hydrogen in the first place. Electric doesn’t have all of the answers, but if I were a betting man, it’s what I’d be putting my hat on. Now, can they start working on an electric motor that sounds like a V8 please? Without doubt interesting times to pan out ahead and whilst Classic Hub is in future mode, will it be electric driverless vehicles? I know it’s a bit odd for a classic-focussed Blog to be harping on about fancy, new, electric cars – but they interest me. It has been a long time since I was this interested in new cars! But driverless vehicles? No thanks. If I wanted to travel with something else in control, I’d catch the bus or a train. I can seriously invisage a future society with driverless cars were driving cars would be for recreation. Technology brings us self parking, auto safety braking and auto lights, wipers. That combined with ever increasing number of vehicles is changing motoring and transportation in general. We can see the change in the past hundred years, and so much can change in the next one hundred. Have we had the sweet spot of motoring? See I love driving too much. I just don’t want to not do it! I may like electric cars, but I’m still someone who loves motoring – whatever the power source. I’m not terribly keen on a lot of driver aids either – one reason I love the 2CV. I was very pleased that the 2013-on Leaf has a proper, mechanical handbrake! Electric vehicles will never make sense while they are running on electricity that does not come from a completely sustainable source. The dirty diesel should be discouraged and petrol or LPG & LNG use encouraged until the battery technology and sustainable electric generation is available. Hydrogen will be good, but the power to make it must be sustainable too. You are right that hybrids are a temporary novelty. That isn’t entirely true. Even if the electricity is generated using fossil fuel, it can actually be better for the environment. I agree with you on hydrogen. Too much thought is being given to how green the cars are, rather than how green producing hydrogen is. Power stations already exist. Building new factories to produce hydrogen is just silly.